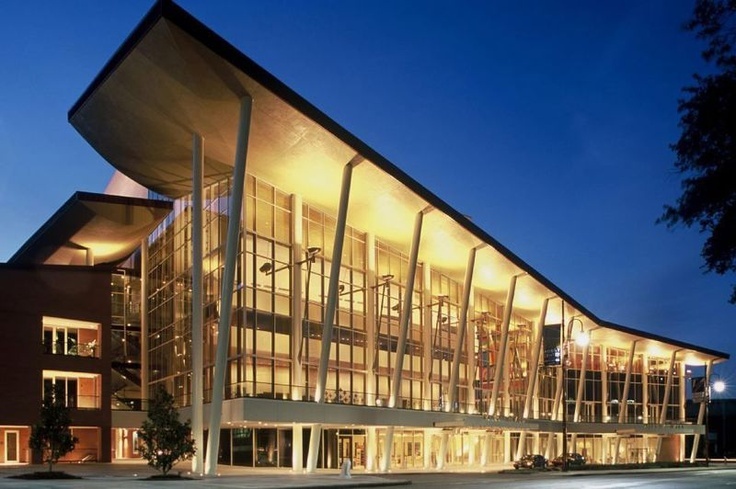 The Hobby Center for the Performing Arts, stands as the premier entertainment complex in the Houston Theatre District. 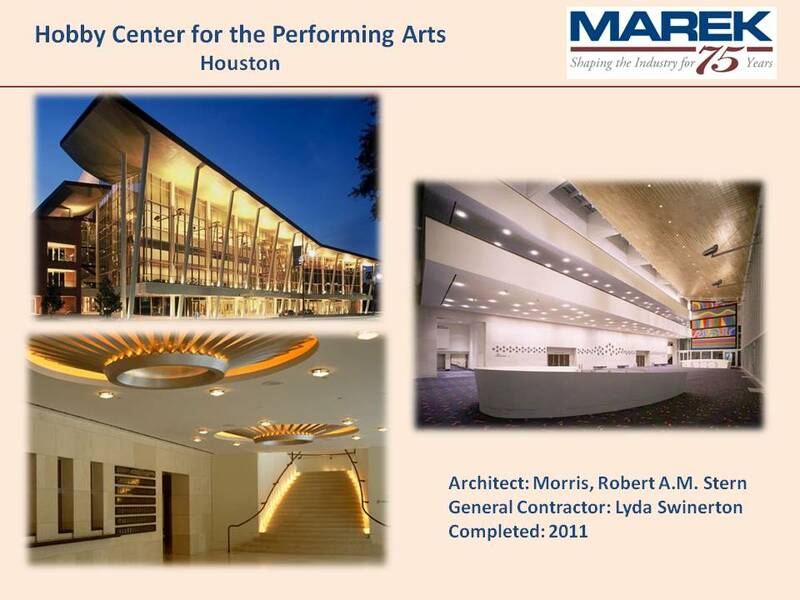 Due to the ornate architectural design and high level finishes, Hobby center was one of the most complex projects Marek has worked on. 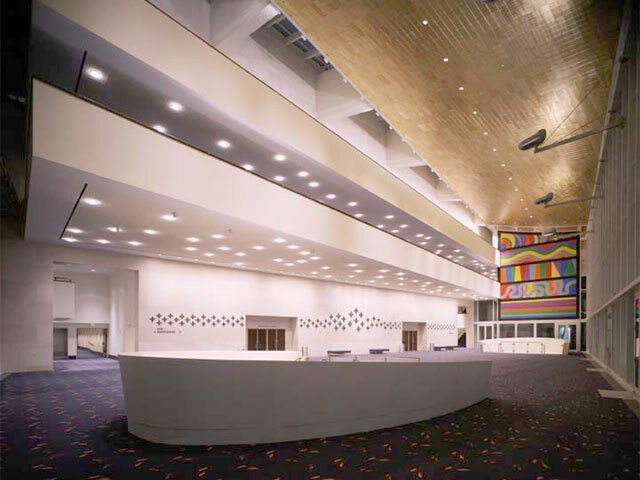 With its compound radius ceilings, furrdowns, soffits and walls up to 90 feet above the main floor, Sarofim Hall presented the highest degree of difficulty. Our craftsmen spent most of their days working from scaffolding constructing the interior of this hall. The finished product had to be of highest quality, all radius lines had to be crisp and true. The critical acoustics of Sarofim Hall added difficulty. In order to reduce sound transmission, the acoustical design required special layout of all metal stud framing, and gypsum board was installed 2 to 3 layers, in some areas, plaster was applied to metal stud framing. In order to support this additional weight, 16 gauge metal studs were required. Many of these heavy gauge studs had to be bent in the field with a special machine to form the radius elevations as required by the drawings. For as much of our work that is visible, there is three times the amount that you cannot see that lies behind the finished surfaces, such as – 2,000 sound insulators above gypsum ceilings, 4,500 l/f of acoustical insulation joints at drywall partitions, 80,000 s/f of 2-hour horizontal shaftwall sub-ceiling and mechanical duct wraps, 25,000 l/f of inwall backing, and 200,000 s.f of acoustical insulation are just a few examples. Act I: Sarofim Hall Scope of Work: Laid out and established all elevations and constructed all of the walls, furrdowns, soffits, radius work, and ceilings. Basically, everything you see with the exception of the domed ceiling was created by Marek. The radius soffits and ceilings with gold leaf finish and lattice around the dome work is constructed with metal stud framing and gypsum board. The plaster finish around the proscenium is applied to metal stud framing. 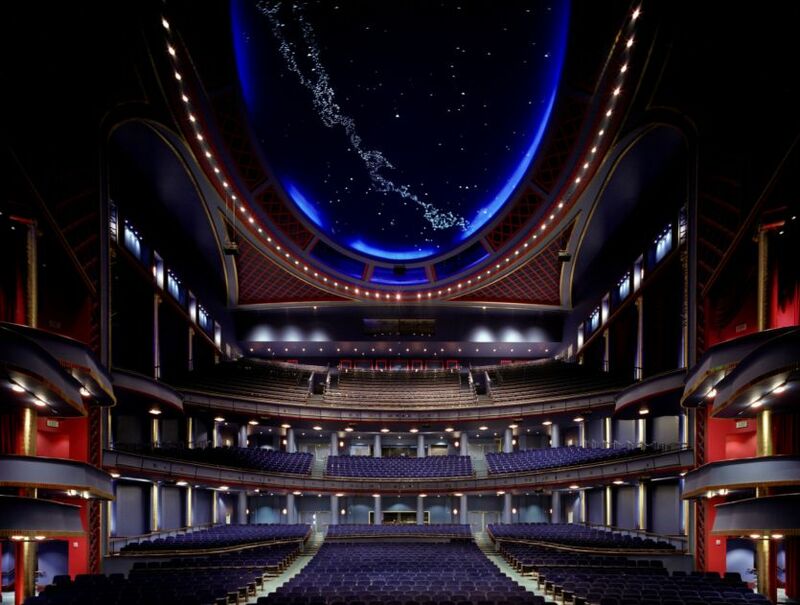 We also installed the gold leaf columns that are made of glass reinforced gypsum, and the acoustical stretch wall (dark blue fabric) at all of the lattice work and at the back of the hall, the acoustical panels at vestibules and orchestra pit. 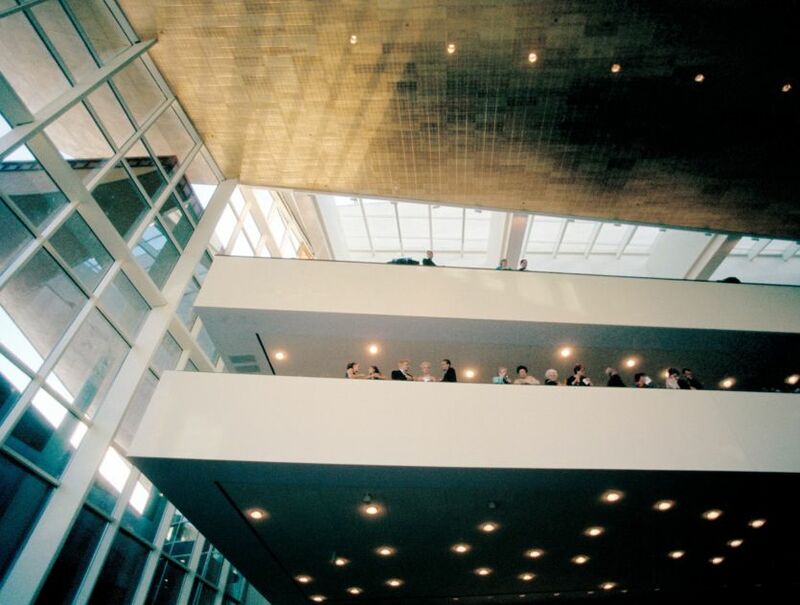 Act II: Main Lobby, Intermission Corridor and Restroom – Metal stud framing and gypsum board partitions, ceilings, furrdowns and soffits, glass reinforced gypsum light coves. 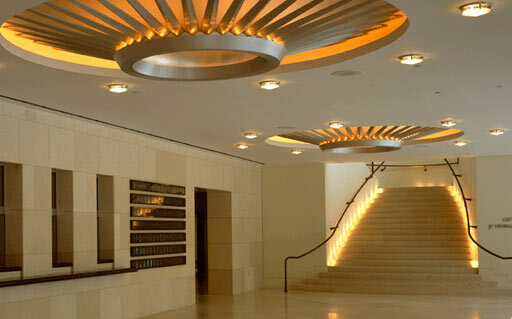 All acoustical ceilings and acoustical gold leaf ceilings, metal stud framing and gypsum board for all art work. 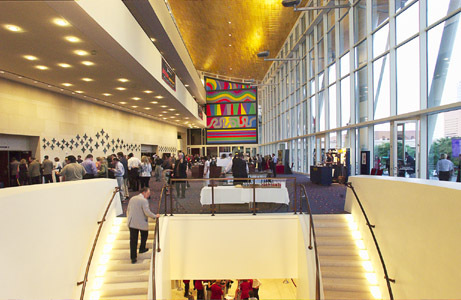 Act III: Back Stage Performance Support – Gypsum board systems, acoustical ceilings. Act IV: Administration (BARR) Building – Metal stud framing and gypsum sheathing at exterior wall for brick back-up. All metal stud framing and gypsum board partitions, ceilings, furrdowns and soffits, acoustical ceilings and sound panels.